"We will not enlist, although we feel it is a right and duty to defend Israel - but the orders of the Creator are above those of man." 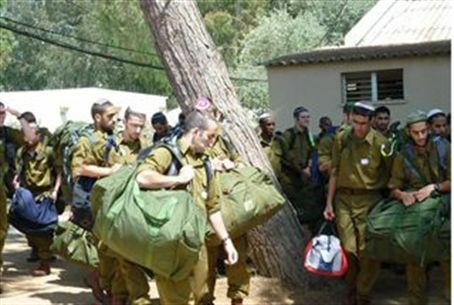 About 100 young religious Zionist men aged 15 to 18 have signed a petition in which yeshiva students declare that they will not serve in the IDF unless changes are made that allow them to maintain their religious level of observance. According to daily newspaper Maariv, the petition states that the initiative is a reaction to the IDF instruction not to allow religious soldiers to avoid entertainment events in which women sing on stage. "We, youths aged 15 and up who believe in G-d and His Torah, see it as a right and a duty to fulfill the mitzvah [commandment] of conquest of the Land of Israel, and to defend the Nation of Israel and the Land of Israel," the petition begins. "However, we declare that we are fully committed to the Torah and its mitzvot… We will not enlist to the IDF [at this point]. The orders issued by the Creator are above those issued by any flesh-and-blood source." "We are sorry to say that especially lately, processes are taking place in which there are attempts to force soldiers to disobey the mitzvot of the Torah through orders (as in the case of listening to women's singing). This matter worries us very much and we declare that as long as these attempts do not cease, we will no longer be able to enlist to the IDF." A week ago, yeshiva students addressed a letter to the IDF Chief of Staff asking him to reconsider the orders that religious soldiers shall not be excused from viewing women's singing at military events. The entire issue arose when a commander did not allow hesder soldiers, who requested permission to leave a performance, to do so, and demoted several of them. IDF Chief Rabbi Peretz did not come out on the soldiers' side, leading to criticism of his views in yeshiva circles. In addition, in the past, wrote Rabbi Yaakov Meidan, Dean of the Har Etsion Hesder yeshiva, in a Hebrew article in the Makor Rishon newspaper, soldiers did not attend such events if they explained their religious compunctions. Instead of admitting to a mistake on a freedom of religion issue, the IDF joined the media in calling it "exclusion of women" and making this minor exception for religious soldiers an unecessary struggle over whose orders are paramount, the IDF's or halakhah. During training and combat, the halakhah itself rules in favor of the commander's orders, Rabbi Meidan noted.